(2) We have a new system to view your newsletter subscriptions. Click here, then enter your email address on our Subscribe page. You will then be emailed a link that allows you to change your newsletter preferences or your email address. Our newsletters are for 3 entities - The Detroit College Promise (nonprofit that provides scholarships to Detroit students), PathologyOutlines.com (free online pathology textbook) and DermatologyOutlines.com (free online dermatology textbook). (3) We recently posted two new articles on our Management Page, Underpayment of Pathology Technical Component, by Mick Raich, Vachette Pathology and Payor Relationship Management Strategies and Trends: A Revenue Cycle Management Perspective, by Leigh Polk, PSA, LLC. The Management Page is accessed from the Home Page under Clinical Pathology chapters, or click here. Thanks to Drs. Ashley Schneider, Julia Bridge, and David Wagner, University of Nebraska Medical Center, Omaha, Nebraska (USA) for contributing this case. To contribute a Case of the Week, follow the guidelines on our Case of the Week page. 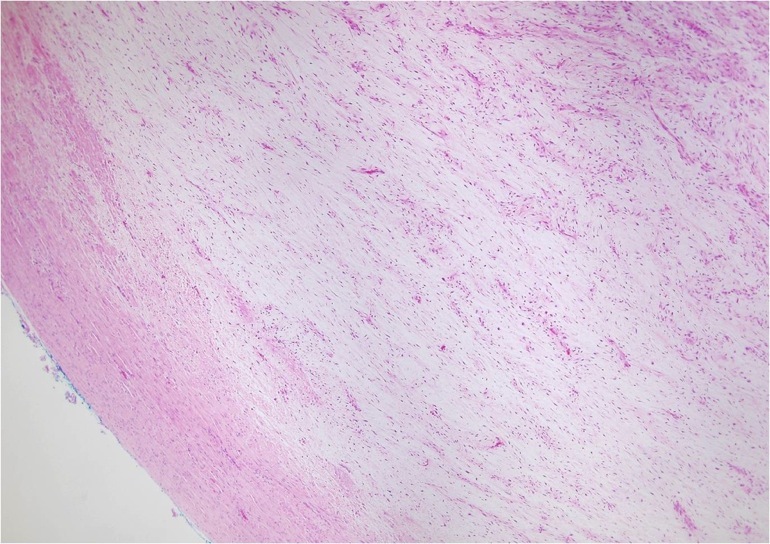 A 58 year old woman presented with an enlarging subfascial mass near the right scapula.� An excisional biopsy was obtained. The mass was negative for CD34, S100 and smooth muscle actin. Molecular cytogenetics (FISH) on the neoplasm revealed a t(7;16)(q32-34;p11) FUS-CREB3L2 fusion in 90% of examined cells. 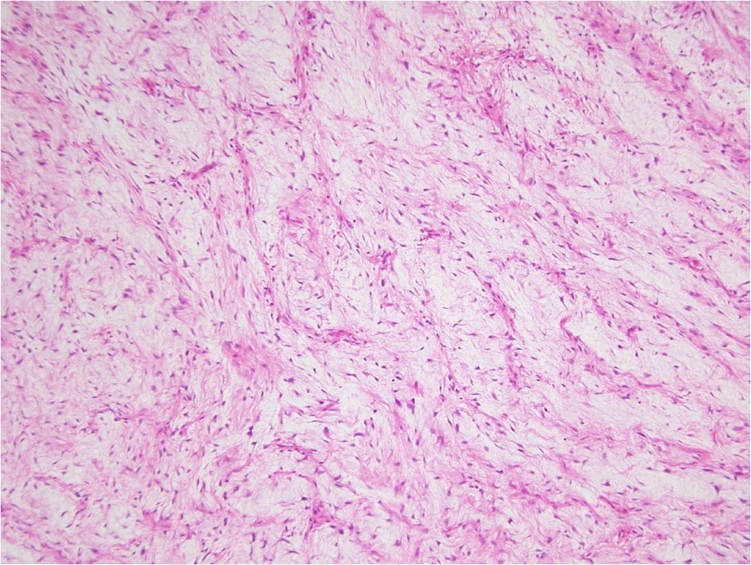 This translocation is characteristic of a low grade fibromyxoid sarcoma. The presence of a thick capsule is somewhat peculiar in this case, as most low grade fibromyxoid sarcomas show microscopic invasion into surrounding tissue. However, these lesions also tend to be well circumscribed on gross examination. Low grade fibromyxoid sarcomas is a rare, deceptively bland tumor first described by Evans (Am J Clin Pathol 1987;88:615). 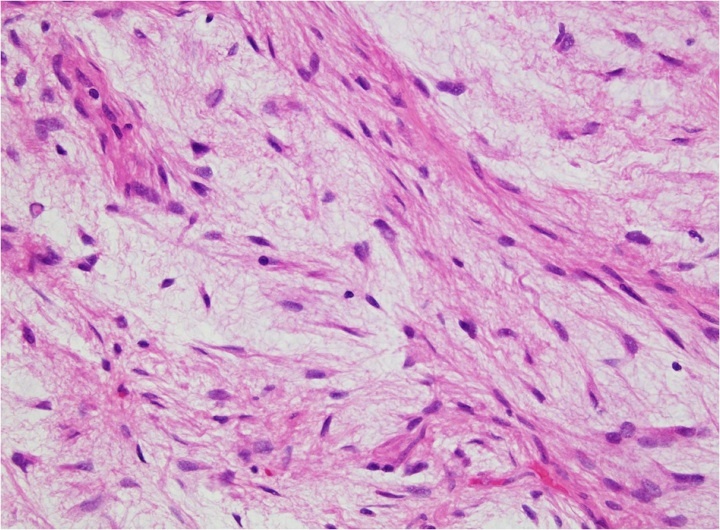 It is usually found in soft tissues of adults (PathologyOutlines.com-Soft Tissue Tumors part 1). The tumors are whorled with bland spindled cells and areas of highly myxoid stroma. Nuclei are elongated and nucleoli are small. There is no significant nuclear pleomorphism or mitoses (Arch Pathol Lab Med 2006;130:1358). There may be epithelioid areas or collagen rosettes. The tumor cells are immunoreactive for vimentin, CD99, and bcl2, and negative for keratin, CD34 and S100. These tumors are closely related to, but morphologically distinct from the hyalinizing spindle cell tumor with giant rosettes. Both neoplasms share the same balanced translocation resulting in a FUS/CREB3L2 fusion gene. Fine needle aspiration often results in an equivocal diagnosis (Cytopathology 2009;20:304). 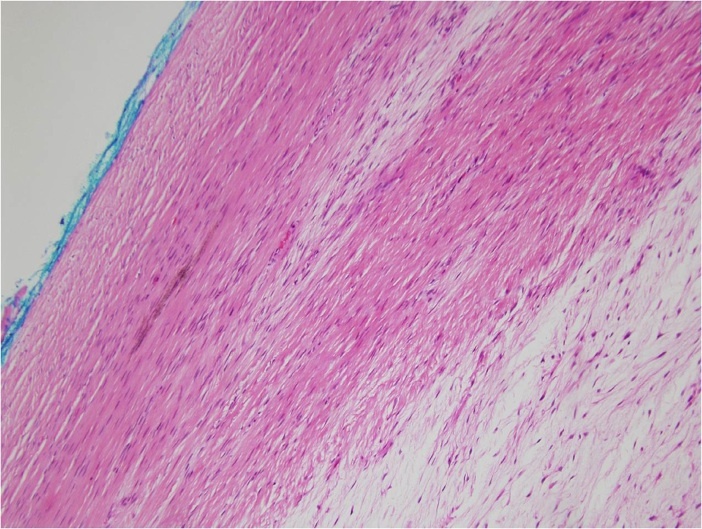 Myxofibrosarcoma: more myxoid and less fibrous, more nuclear pleomorphism and hyperchromatism, a vascular network with prominent curvilinear and elongated capillaries is present (Histopathology 2004;45:29). Desmoid fibromatosis: no myxoid areas, fibrous cells are aligned straighter, cells appear more like reactive fibroblasts, distinct slit-like vessels are present; tumor has diffuse or occasionally focal nuclear beta catenin staining (AJSP 2005;29:653). Neurofibroma: wavy nuclei, background of thick collagen bundles, S100+. Treatment is complete excision. Despite their bland appearance, they may recur locally or rarely metastasize, but this appears to be less likely with aggressive surgery.